Along with the American Academy of Pediatric Dentistry and the American Academy of Pediatrics, we recommend that a child’s first dental visit be scheduled by his/her 1st birthday. Establishing good habits early, both dietary and hygiene, will offer the best chance for a cavity-free childhood. Children respond very well to routine and repetition. Introducing them to dentistry early will allow us to develop trust and eliminate the fears and anxieties most of our patients' parents had as children. Future dental treatment, should it be necessary, is made significantly easier by the rapport established over the first few visits with the doctors, staff, and office. Parents should not make a big deal out of any dental appointment and should refrain from using any words that could cause unnecessary fear such as “needle, drill or shots.” We are experienced in dealing with anxious children and can explain treatment procedures in a positive and pleasant manner to avoid any negative feelings towards dentistry. Reading your child a book about their favorite cartoon character going to the dentist often helps. Log onto www.mychildrensteeth.org for pediatric oral health information. For most patients with routine dental needs, the first visit will include: an exam, an education with the dentist and clinical staff, plus a dental cleaning, x-rays and fluoride treatment appropriately based on the age of the child. We will review diet and oral hygiene recommendations and any treatment needs for your child. Most new patients are seen in an open clinic setting with other children present. This allows younger children to model good behavior by observing older children as well as allowing siblings to stay together, and helps create a less intimidating environment for anxious children. •For younger children there is lots of "tell-show-do" to help kids become comfortable with the sights, sounds, and sensations at the dental office. Parents are more highly involved during these visits and the extent of treatment will be determined by the child's level of cooperation and the parent's desires. •With older children and teens, the staff will help give the patients the skills to take responsibility of their own oral care at home with less parent involvement. We will record the child’s dental and medical history, complete a comprehensive examination and discuss any findings with you. We will also review the importance of maintaining a good dental health program with you and your child to ensure a healthy and beautiful smile for life! 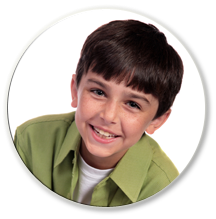 We want you to leave our office informed, impressed, and inspired to tell all of your friends about A Kidz Dentist!